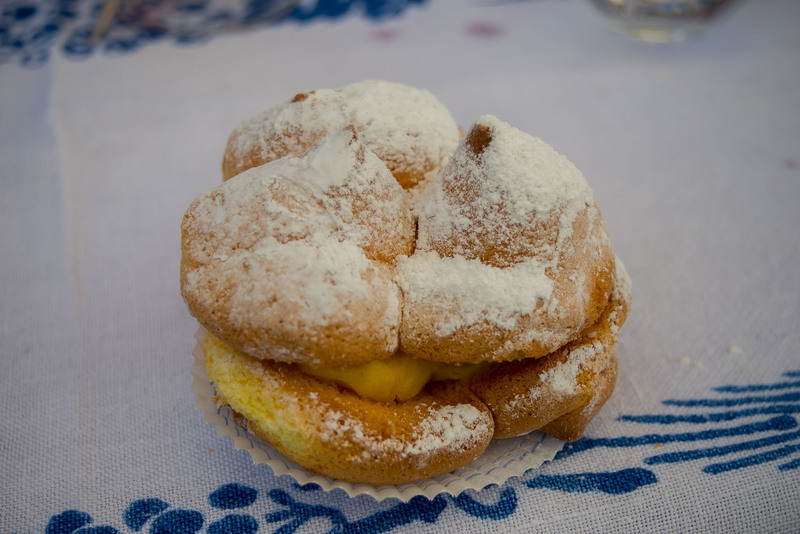 They are delicious, soft as can be and stuffed to bursting with sinful crème patissiere. One of these and a black coffee and your morning is off to a good start. Personally I am eating them just after an al fresco breakfast consisting of superb cured meats, pungent cheeses and a fair few glasses of Valentina’s lovely wines, so I am using the coffee and sugar to offset the alcohol I’ve knocked back. It’s not even 11am yet but no one has suggested a spittoon, in fact on this whole trip only one winemaker ever will. Italians do not waste their wine, it seems. The cakes are unique; only made in this particular part of Abruzzo and the wines that Valentina and her brother Luigi manage and market at Tenuta I Fauri wines are special too. Of course I drink lot of her excellent Montepulciano, the wine synonymous with the region, and her Ottobre Rosso is a cracker, but also a lesser known Abruzzo white wine called Pecorino. When I first heard this mentioned, in Italian which I don’t speak, I assumed someone was talking about cheese. 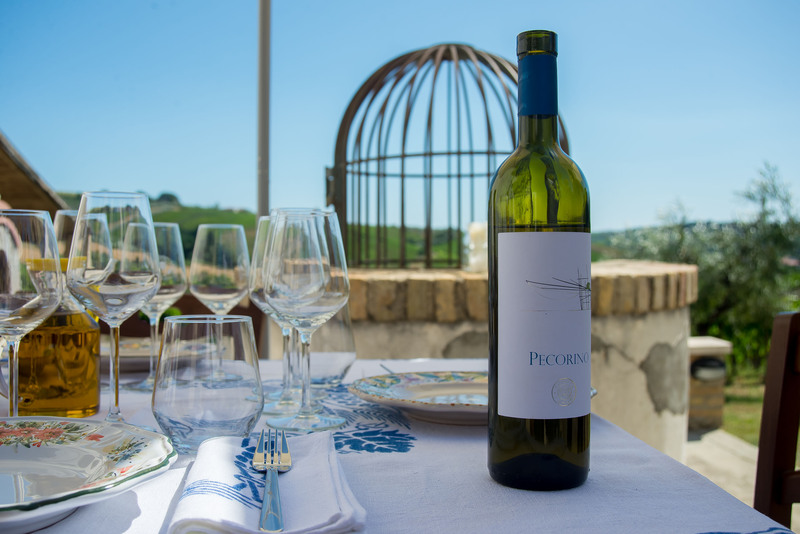 Pecorino is the slightly cheaper cousin of Parmesan, often used as a decent substitute, but a wine called Pecorino? Turns out it’s a very nice wine indeed, ideal drinking in the 33C + temperatures I’ve been baking in since arriving on the Adriatic coast from Rome via the Abruzzi Apennine mountains. It’s a two-hour journey that involves miles and miles of tunnels that burrow through the mountains, hair-raising elevated sections of autoroute and brief glimpses of pendulous and beautiful ancient hilltop towns seemingly sourced straight out of fairy tale books. Abruzzo is undeniably stunning. Pecorino is a wine they drink every day here. 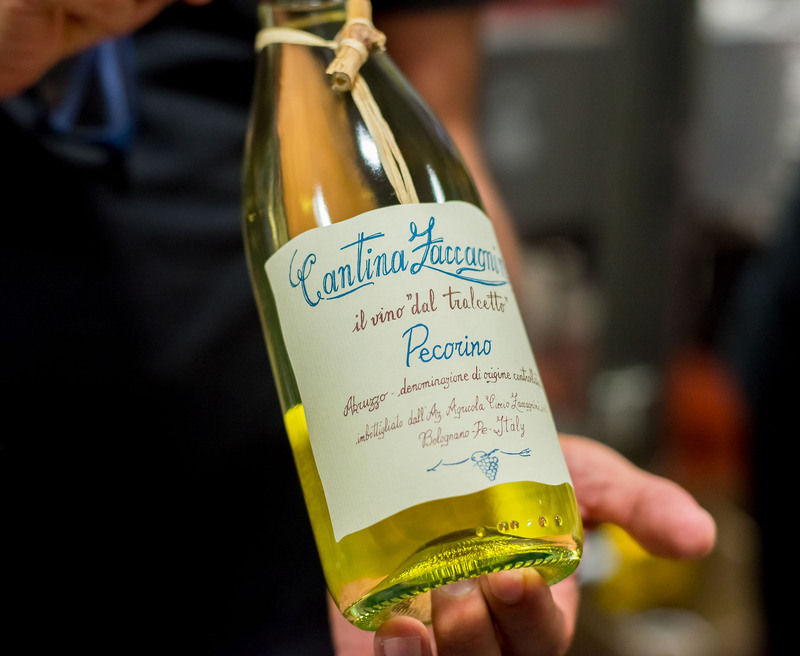 Made from the ancient Pecorino grape, it tends to be a favourite of the more skilled and exciting winemakers and doesn’t get much custom outside of Italy. The wine is pale straw colour, fresh tasting with a bit of citrus on the nose and a mineral ‘tang’ on the palate, great with light pasta dishes. Valentina’s family use concrete wine tanks for their wines and not steel, in fact they are now busily replacing the original concrete tanks that were broken up and removed, in response to what they believe were misguided fashions in winemaking, many years ago. And the Pecorino wine partners so well with hard sheep cheeses and cured meats that it’s a perfect aperitif wine as well. Plus, as I’ve discovered, it makes a very good ‘breakfast wine’. In fact, I think I may have found a gap in the wine market with this new and exciting drinking occasion. You heard it here first. At Dora Sarchese they’ve installed a wine fountain in the grounds, not a fountain to look at but one to drink from. It’s just like the ones we had at school only red wine gushes forth, and not brackish water. I want one in my garden. The ostensible purpose is to offer free thirst- quenching drink 24 hours a day as a gift to pilgrims on the Cammino di San Tommaso way. It is not an open invitation to party animals though, says family patriarch Domenico D’Auria as we wander inside to try some ‘proper’ red, his Rosso Macchia. The label features a large version of his thumb print, to show his personal passion. ‘Someone could scan that and then access your iPhone,’ I say jokingly, much to his bemusement when it’s translated to him. ‘Android!’ he cries, waving his phone at me. He’s a lovely genial man and all the wines I try with him are excellent, especially his Esmery’s, a sparkling wine that once again gives me cause to wonder why Champagne gets all the good press. Still, no time to stop and wonder but instead off to De Sipio for some more sipping. 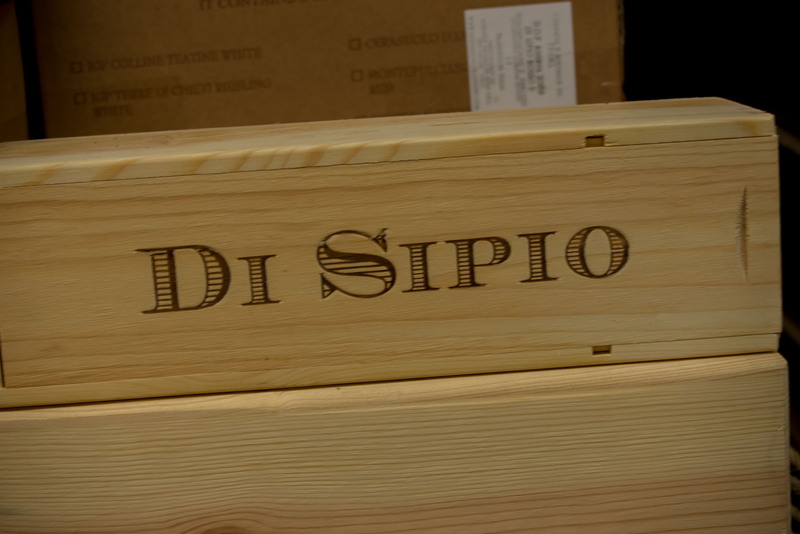 Nicola Di Sipio made, and still makes, a lot of money building brakes and clutches for cars he even has a factory in England, but his family not so long ago worked as labourers in the vineyards he now owns, thanks to his E100 Million a year car part business. 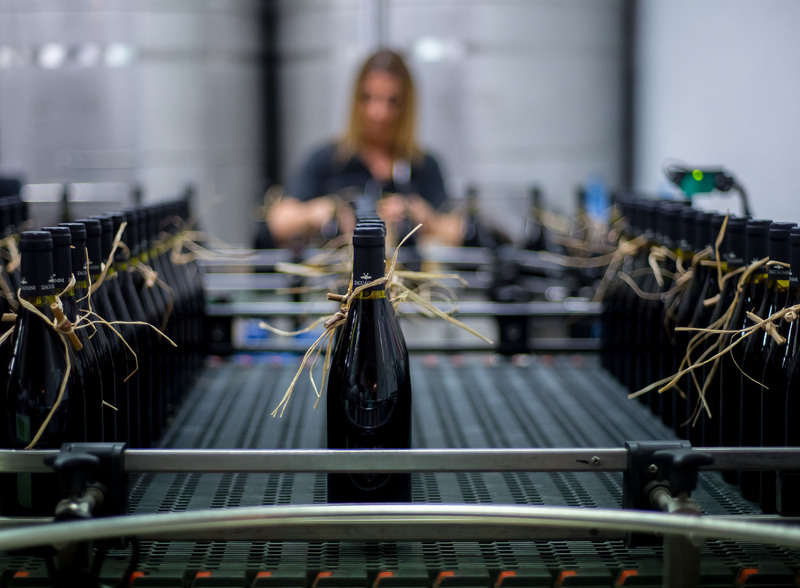 The idea of buying the vineyard, apart from because he could, was to make a few thousand bottles of sparkling wine a year, but the business soon grew. Now the ultra-modern winery, beautifully integrated into the landscape produces 120,000 bottles of sparkling wine, white and rosé as well Montepulciano, Riesling, Falanghina, Cerasuolo and Trebbiano. His wild-haired daughter Giulia takes me through all of them, with a small dish of food to accompany each to demonstrate their pairing qualities. Beautiful dishes, superb wines. The Di Sipio Brut Rose with buffalo mozzarella and black truffle is a joy and their Riesling surprisingly good, if not exactly Riesling in taste. That night we go to a small restaurant in Bucchianico, once the ice house of the village, called La Neviera . 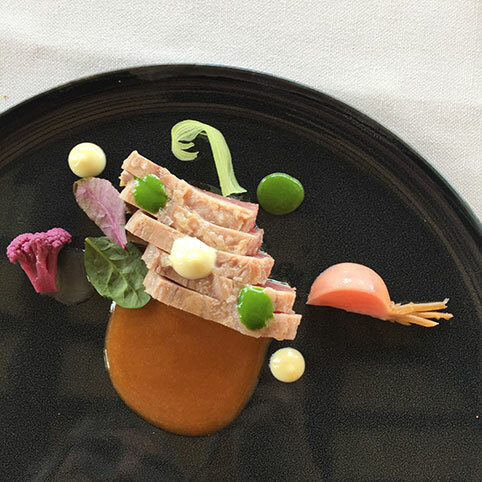 Here we drink wines to go with the modern, and accomplished cooking of the chef. 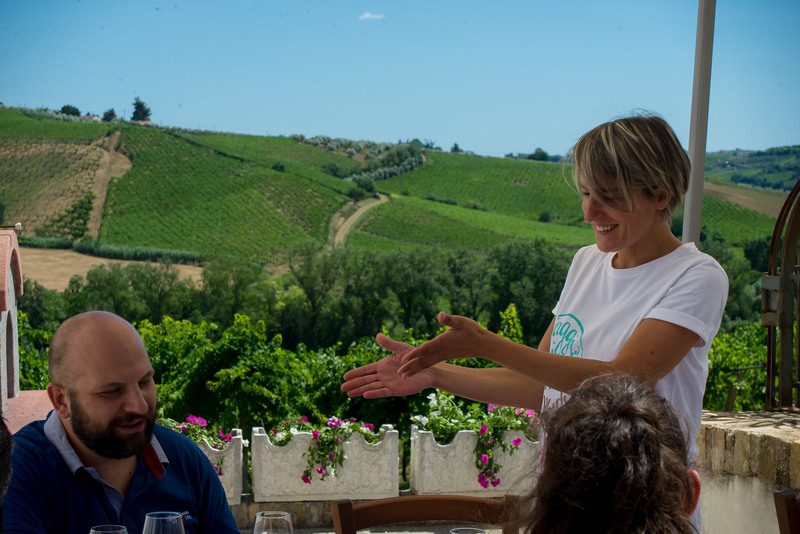 Wines such as Dora Sarchese’s cheeringly crunchy Pecorino, as well as a thunderingly good Trebbiano Nicola Di Sipio Reserva from her own vineyard. We leave in a jolly mood, well after the village has gone to sleep. The Adriatic coast is miles of beach; you won’t find many non-Italians on it because it’s relatively unknown as well as unspoilt. Hotels are old-style for the most part, mine in the coastal town of Pescara feels like it never left the 1960s and that’s no bad thing at all. 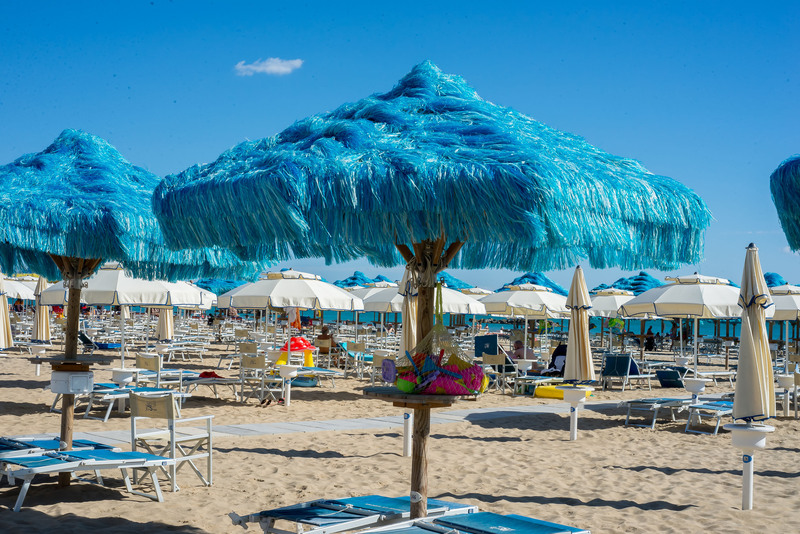 Glancing at the beach and the sunbeds and parasols as I wait to be picked up by my hosts, I rather wish I had the time to lie down but instead it’s off to Zaccagnini in Bolognano, about half an hour’s drive inland. 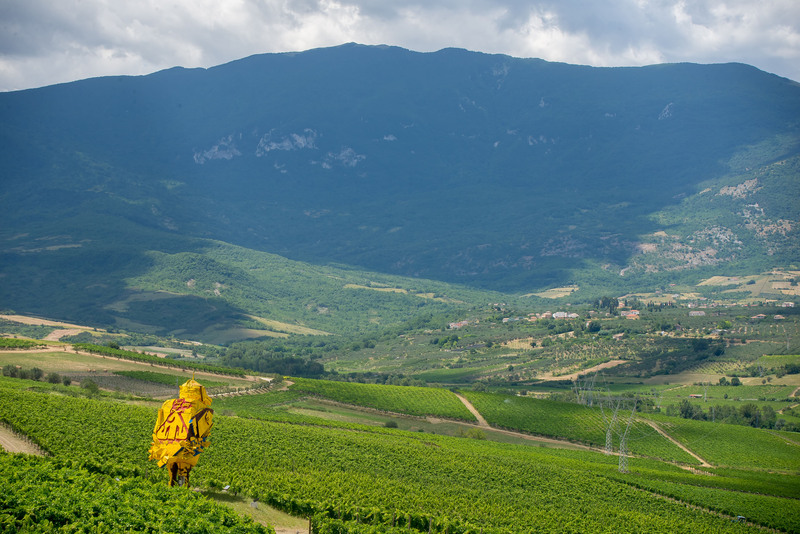 This super modern winery sits on the edge of a giant bowl of land, the wind is constant and powerful as I look out over the vineyards and the giant yellow chicken that is one of the installed artworks out among the vines. 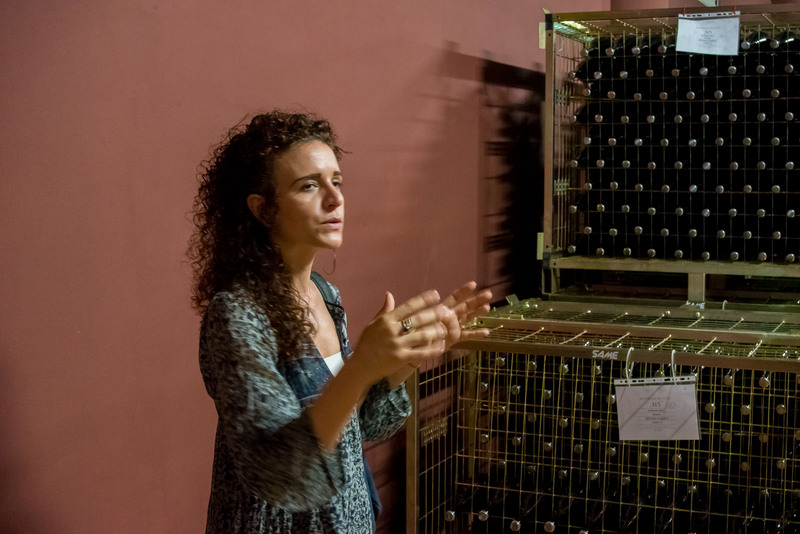 Cantina Zaccagnini has a strong belief in the power of art as well as of wine, the art collection inside and outside is a well -curated one and began with the vineyard’s early connection with the German artist/shaman Joseph Beuys. Pictures of him in his trademark hat presenting his project “Difesa della Natura” in the old 1984 winery are everywhere inside. We take a golf cart for a ride to the tasting room set amid the vines and with a long glass wall for the perfect view. We taste the Clematis, made from Montepulciano grapes that have been allowed to wither in the vineyards. The wine spends three years in tanks and then one year in the bottle before being sold. Another stand-out is the Yamada, Japanese for “Mountain field”. 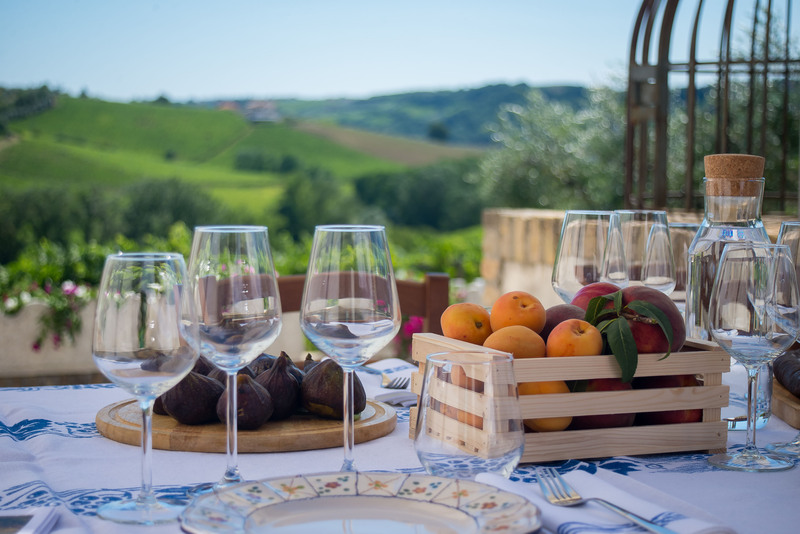 A Pecorino bursting with citrussy aromas, and the Aster Rose, made from 100% Montepulciano grapes and bone dry with an attractive creamy effervescence that shouts of wedding receptions on perfect summer days. In Abruzzo no matter how high you drive there always seems to be another beautiful village town looking down on you. It takes quite a while to get to Calascio, the highest fort in Italy, with the road becoming thinner, more unkempt and worryingly lacking in edge barriers with every kilometre that passes. A tiny place, often cut off by thick snow in the winter, it has a small restaurant, the Rifugio della Rocca, dangling off the rock where the pasta with rabbit is fantastic, as is a bottle of Marina Cvetic, made from thirty year old vines and which is a classic Montepulciano – a real Poldark of a wine, brooding, intense, irresistible and no doubt good to serve with pasties but best kept well clear of your wife. Fortified I climb on wobbling legs higher still to the ruined fortress above where the views are magnificent and far reaching. Part of a defence system centuries old, the fort would see trouble coming far off and light beacons to warn the next fort along. It’s one of the best views you’ll ever see. 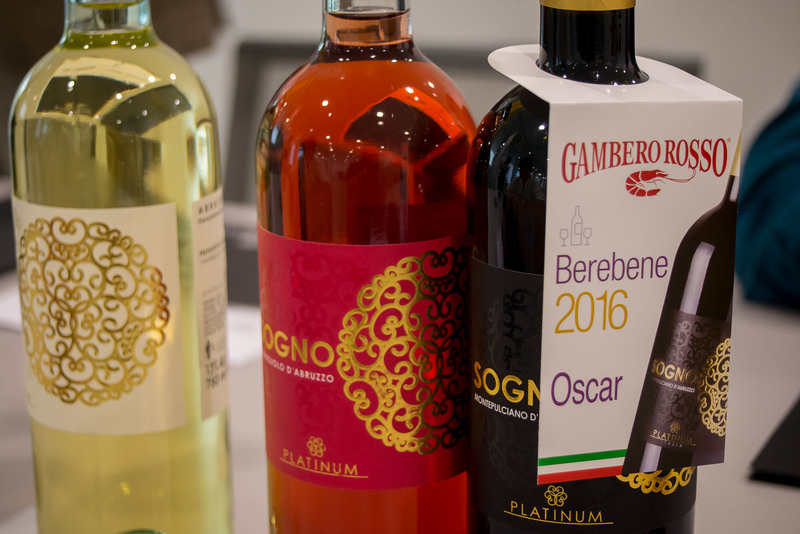 ‘Even the cardboard outer is assembled by machines, in a glass case under nitrogen,’ Daniele Pasquali of Platinum wines tells me proudly. His wine box, or bag in a box product is state of the art wine-boxery and seeing my sceptical face he explains why he thinks it’s the future. For a start, it’s the convenience. A glass of wine in perfect condition whenever you want it. 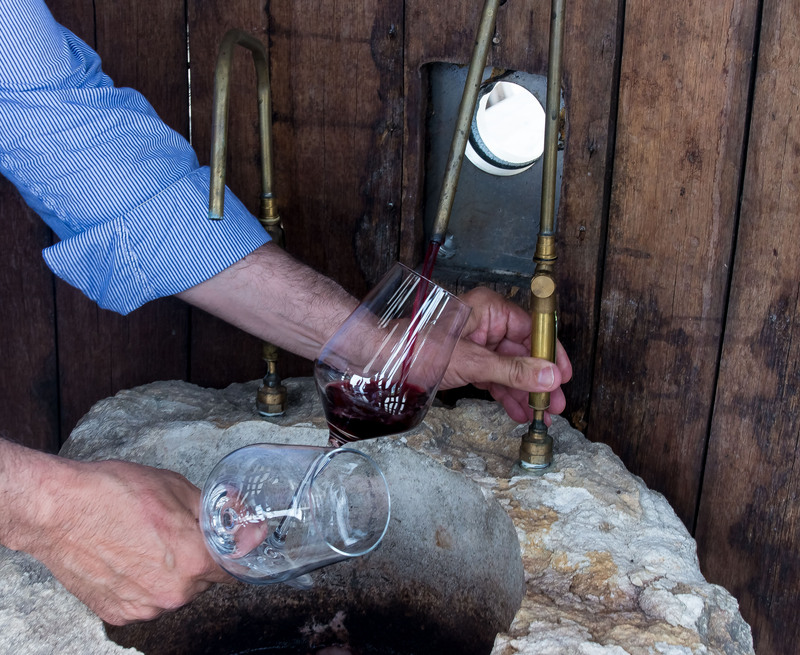 He says that once the tap is unsealed the wine will last at least 60 days and be as good as the day it was opened. Also a wine box is easily recycled, he is sceptical that the glass we all so carefully separate out does all get recycled in the real world, and the packaging adds no weight to the dustbin which is good for the refuse men. The wine comes straight from the giant tanks, so big they had to be built on site, and is micro filtered and bagged under nitrogen. At no point does the wine meet the air. while the bags are triple layered medical grade bags with special seams and corners to make them strong and airtight. The tap, like the bag, is a unique design that aerates the wine as it pours out, achieving in seconds what might otherwise take an hour in a newly opened bottle. 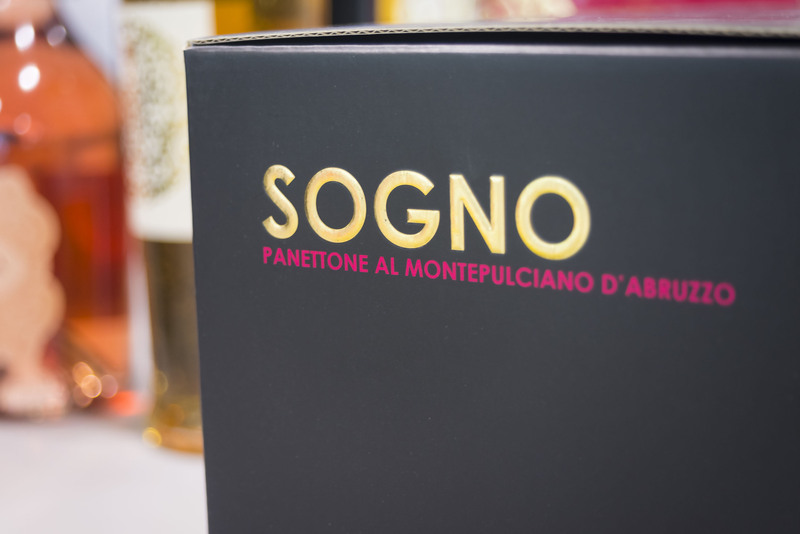 In the tasting room I taste Sogno Montepulciano from the bottle and then the same from the box. I really can tell no difference at all. 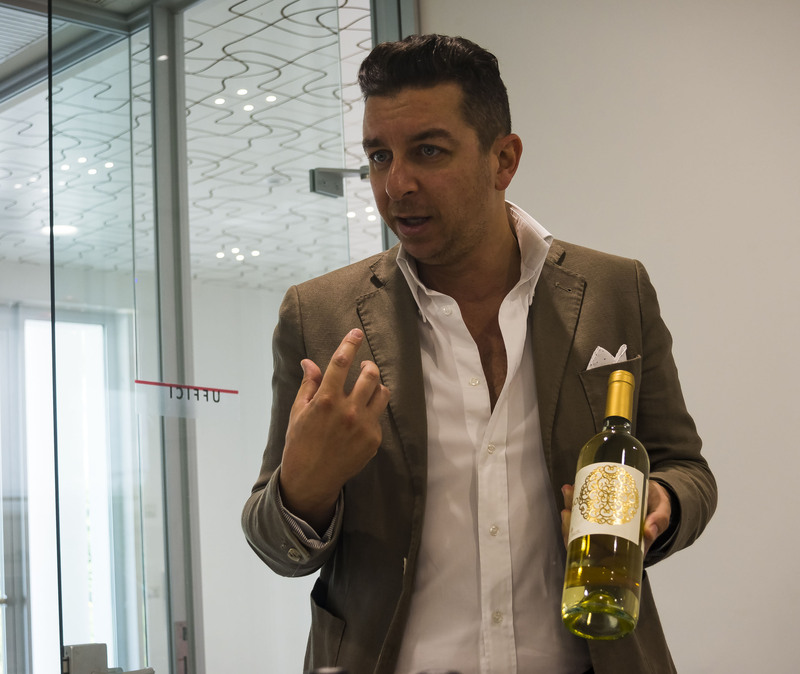 “Bag in the box is ideal for restaurants, when produced in this technologically advanced way,’ says Daniele. ‘They can offer customers a choice of wines by the glass that are as good as wine from a bottle but without the expense of an Enomatic system.’ I’m convinced and forget once again to spit. 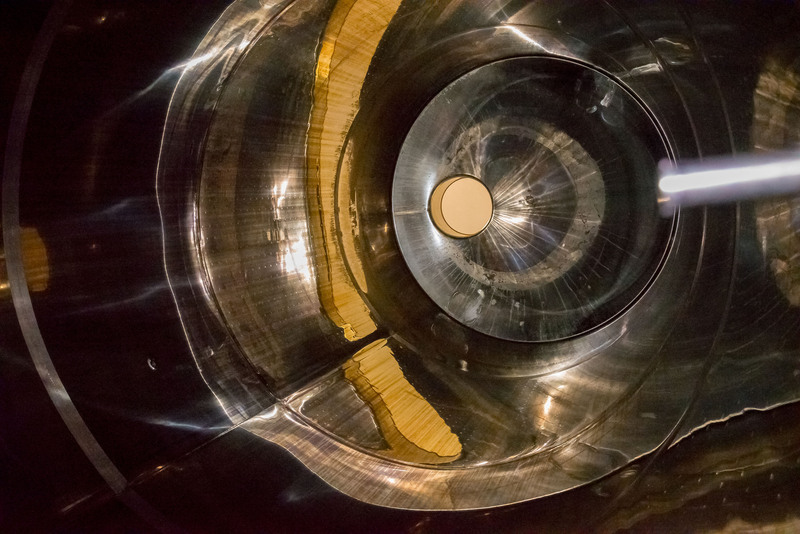 Despite the modernity of the winery, possibly the most space age winery I’ve ever seen, the technology is there to serve the wines and not influence them. The family controls every aspect of production and are eco-farmers, using no chemical fertilisers, and plenty of green manures. Weeding and harvest is done by hand and vegetable compost is laid on thick to reduce water loss. 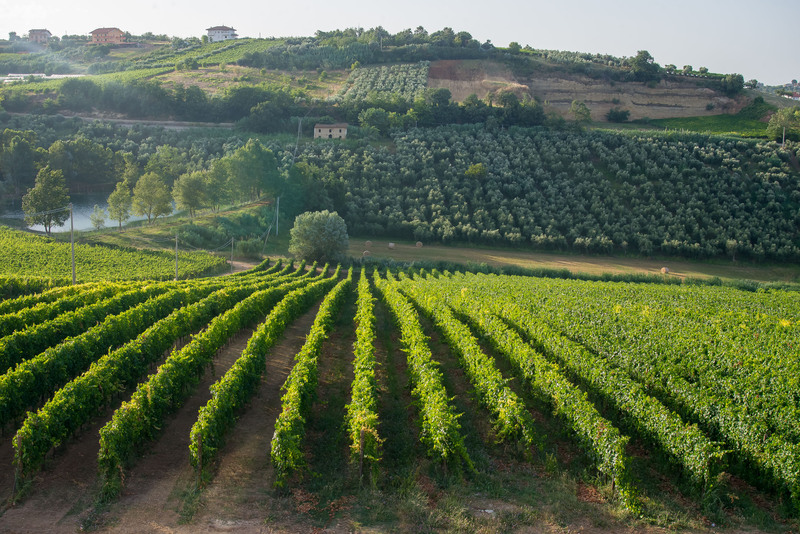 The result is Montepulciano, Pecorino and Trebbiano wines that can lay claim to be among the best in the area. And one final lunch before heading back to Rome and it’s very special. 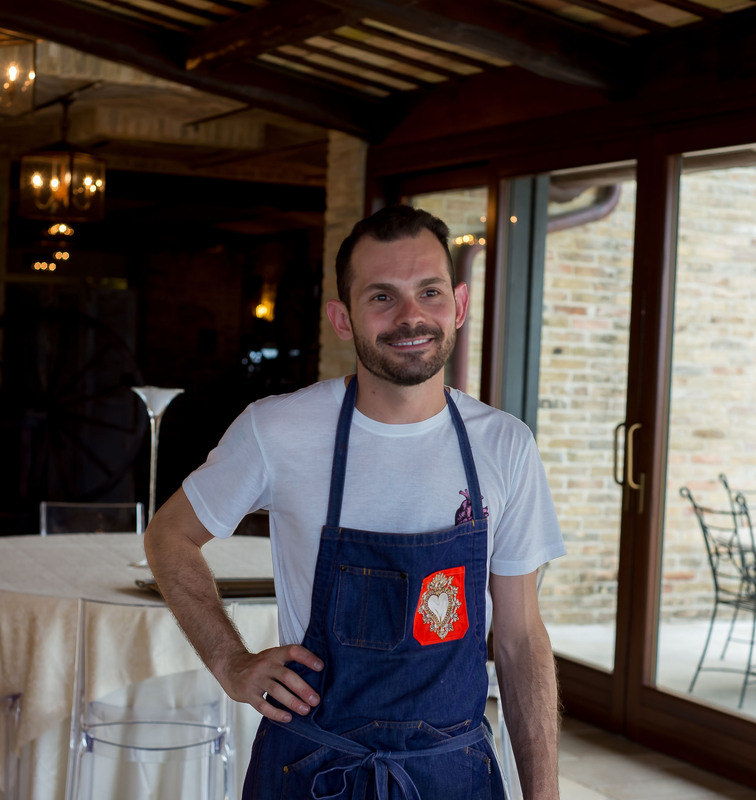 Borgo Fonte Scura is the restaurant of a gorgeous hillside hotel that’s being prepped for a wedding when we arrive. The sun is glowing down out of a cloudless sky and we go inside where we can enjoy the view and the air conditioning simultaneously. It’s a fitting end to my visit. Course after course of perfectly judged food from Daniele D’Alberto a young local chef clearly going places, food that blends tradition with modern techniques and Instagram friendly looks. 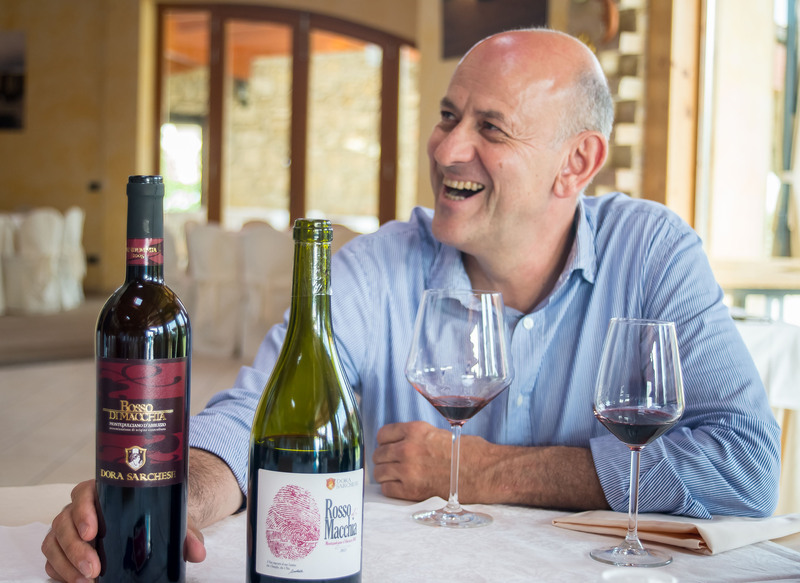 Which rather sums up Abruzzo, a place where food and wine are as enjoyed just as passionately as they are across Italy, but where the people are only now beginning to reach out to the world to show just what they’ve got. 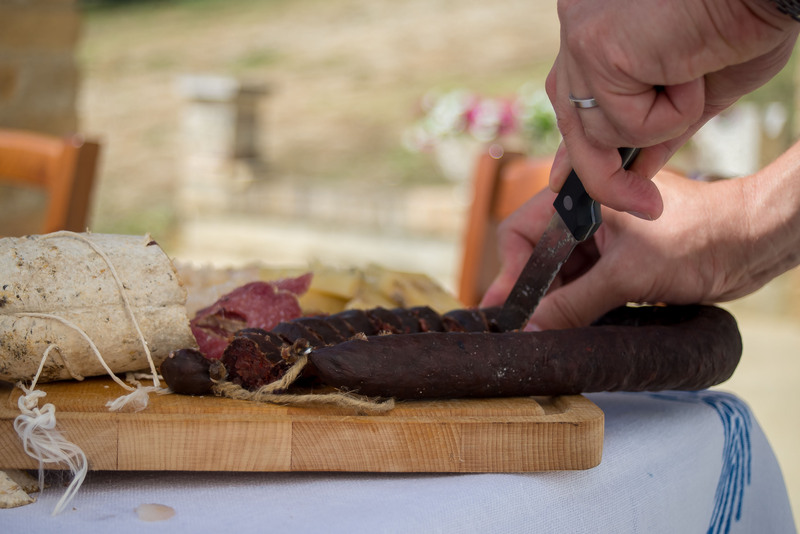 This entry was tagged abruzzo, di sipi, italian cheese, italian wine, Italy, montepulciano, pecorino. Bookmark the permalink. Living in Abruzzo now for 2,5 years I recognize all the beauty and the enthousiasm with which it is described. My wife and me everyday tell eachother how stupid the rest of the world is that they haven’t discovered this best and unspoiled part of Italy. 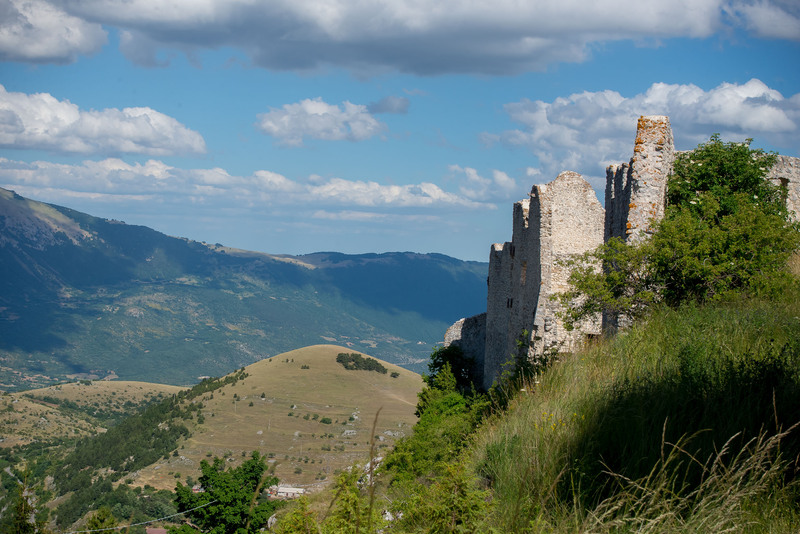 And although we rather would keep everything for ourselves, for Abruzzo it would be very helpfull and rewarding when some more tourists would come and visit this area. Inside Italy, Abruzzo is still underestimated, outside Italy it’s totally unknown. Two hours driving from Rome, more then 200 km of fantastic beaches, uncountless ancient villages, 3 national parcs with serious possibilities for skiing, hiking and biking. Upon that the most friendly and helpfull people you can think off – that don’t speak one word of english. But who cares? “Piano, piano” is their life-motto. And although the crisis has hitted harsh, they love life, their family and the food and wine to share. Spending your time here will be about the cheapiest you ever experienced. But that shouldn’t make you go for it. Being here will be one of your richest experiences ever! Benvenuti! Conrad Rombout, originally from the Netherlands.